Salamanders have been seen in the shapes of fiery balls, or tongues of fire running over the fields or appearing in houses. Traditionally the fire elementals are called Salamanders, maybe because the salamander moves around like a flame that wiggles left and right through the air. Fire spirits do not look like salamanders, they look like moving flames with a vague human resemblance, of which the face is most pronounced. Almost unknown in folktales, fire spirits are difficult to encounter, and contact with them is even rarer than with sylphs. Fire spirits are also not to be messed with and have to be faced with utter honesty and respect. Few magicians will summon fire spirits, because the fire spirits are powerful and contact with them demand a strong mind on the part of the magician. Few visionaries have ever had encounters with them of have been able to willfully see them with their psychic vision. As it is clear that very few humans have ever come into contact with fire elementals, I have found only a few reliable sources of first-hand experiences. The first is William Mistele, a present day occultist, who is able to contact nature spirits through his mind via the system ofoccultisttFranzFranz Bardon (1909–1958). A powerful fire spirit, called Pyrhum, relayed to him a story from the time of Atlantis. By the use of a magic mirror, an enlightened Atlantean magician, He’adra, had summoned Pyrhum, who resides deep within the earth. “Almost without effort, Pyrhum shifted between his world and that of He’adra’s. He’adra’s voice and the energy field he had created had already opened the gate. Pyrhum only needed to step into that space of blazing red light to perceive He’adra face to face. In turn, He’adra perceived Pyrhum coming toward him in the magic mirror which was at one end of his room. A moment later Pyrhum stepped out of the mirror and into the room–the salamander’s body appearing physically in our world by virtue of the energy medium of fire He’adra had created. He’adra perceived in front of him a being like a man in appearance, but the air around him was blurred as if heat were distorting the image of his body or as if his aura was pulsing within its own internal light. Pyrhum’s eyes were like doorways through which could be seen the fires burning inside the earth. And Pyrhum’s voice, when he spoke, was grating and impatient like the voice of a commander who has just captured a city to which he has laid seize for months. And there was a resonance in his voice, something altogether subterranean and plutonic, like the deep, dim rumbling of the earth’s mantel as it splits and rubs against the edge of a continent. 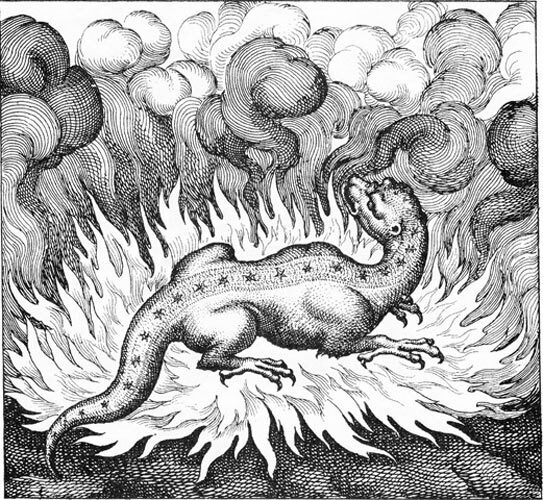 Very few magicians can summon powerful Salamanders, or fire spirits, without negative consequences, as the magician has to be pure enough within his being to be able to withstand the summoned Fire energy, and he has to be spiritually evolved to attract the attention of the Salamanderin the first place.in the first place. “Less than a handful of mortals have ever walked by my side and survived. And only one or two were willing like you to enter the domain where I reign without having to disguise their fear and trembling. I oversee all fire on earth and I care not much for your race. I am not arrogant. I just have no respect for human beings because they have not sought to discover the power hidden in their hearts. They think power is external to the self, that it is found in the ability to bind matter or subject other living beings to their will. “Those who sojourn into my domain are enamored with faith– they want something for nothing without offering anything in exchange. They attempt to enchant me by pronouncing fearsome and terrible names of gods, goddesses, and dieties from various religions. What nonsense! Do they think they can badger me when I can command a sea of magma to stretch out its hand in a strand rising two thousand miles until it punctures the surface of the world and forms mountains three miles tall? These magicians can not even command their own body to pump blood to the part of their heart muscle which is suffocating because an artery is clogged. “Do they expect me to get down on my knees and obey their command? They vainly imagine they are united with God as they babble on raising their voices higher in pitch till it breaks into a shriek. They think by speaking the words of God or by pronouncing His name that somehow their voice is magically transformed into His Voice or their authority into His own. Magicians are often more entertaining than jesters or clowns. “If I close my eyes and concentrate, I can sense all the seas, lakes, and streams of magma which exist within the earth. 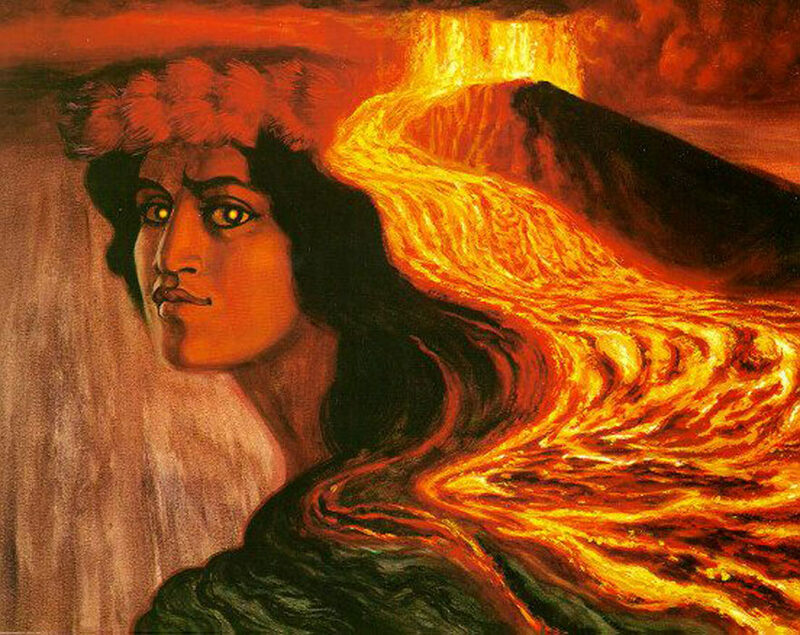 Oh, I have tried to share my wonder and the inferno of my exuberance with those who dwell on the surface of the earth. But it is useless. Their minds are too narrow. Their hearts are too closed. “They see the stars at night. The feel the heat of the sun by day. But they are afraid of the fire within the earth. It is too close. They push it out of their minds. They do not allow their feet to reach down like the roots of trees into the silence and the depths lest they discover in the darkness beneath them a passion greater than they can imagine. Geoffrey Hodson (1886-1983), an English theosophist and visionary has written a lot about elementals and other spiritual beings. He describes the Salamanders as follows. Salamanders appear as if built of flames, the form constantly changing but suggestive of a human shape. The chin and ears are sharply pointed and the “hair” frequently streams back from the head, appearing like tongues of flame. Salamanders dive into the flames of physical fires and fly through them. Their forms vary from place to place. Overall they do not have a fixed form as they consist primarily of streams of fiery energy. When viewed by humans, they display a distinct human face when not veiled by flames. Their eyes are then slanted upwards and strangely lit by fiery power. The head surrounded and outlined by flickering, orange-red little flames. Salamanders vary in height from two or three feet to the great colossi of fire-power who are the Fire Lords associated with the sun. In order to understand the Salamanders, or fire spirits, it is necessary to understand the Element of Fire. Fire is not so much a physical substance such as earth, water and air. It is a high vibratory energy, released by the transformation of one element into another. As an Element it might be easier to understand it as a high vibratory energy that is ever moving, ever transforming. Fire is also expansive and uninhibited. Hodson also gives an interesting view of Fire asbeinggpresent everywhere in space. His description resembles what is now called the vacuum filled with unlimited energy, although it has also other names like thepresent everywhere in space. His description resembles what is now called the vacuum filled with unlimited energy, although it has also other names like the Dirac Sea, or Zero-Point Energy. 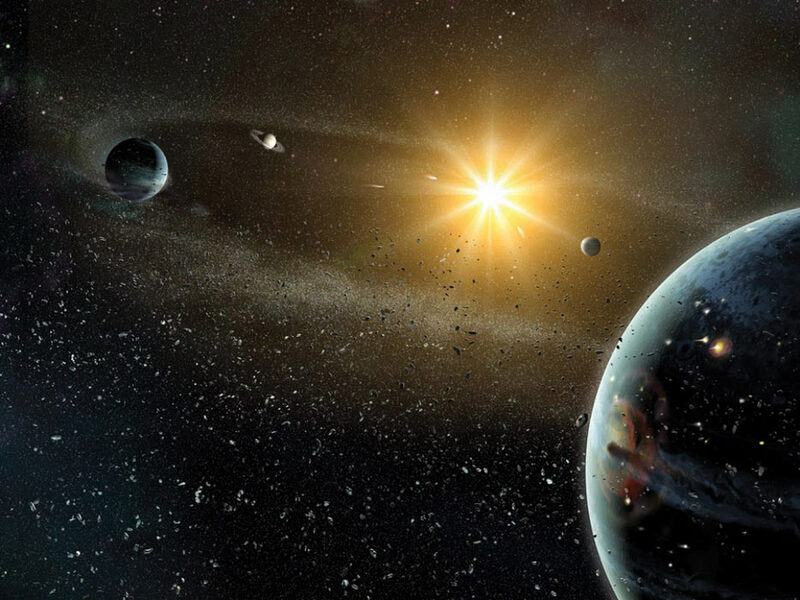 “All manifested life, on every plane, is surrounded and permeated by fire; there is no inter-planetary space; the separation of the globes is but illusion; the sun is not the isolated centre of a ring of planets; there is but one homogeneous whole, fire-filled. 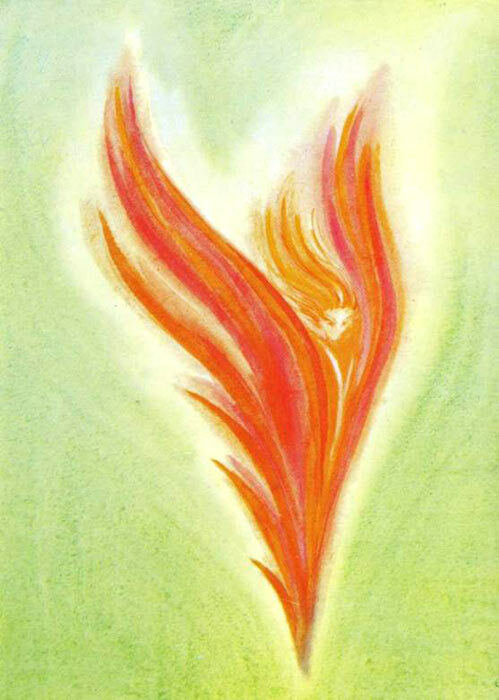 The element of Fire is also to be understand as psychological or spiritual fire, when one is motivated by “an inner fire” to be creative, to be engaged in some task, to be inspired or to be driven to do something. To be of a fiery nature, so to speak. Or a spiritual seeker whose passion is to attain enlightenment. 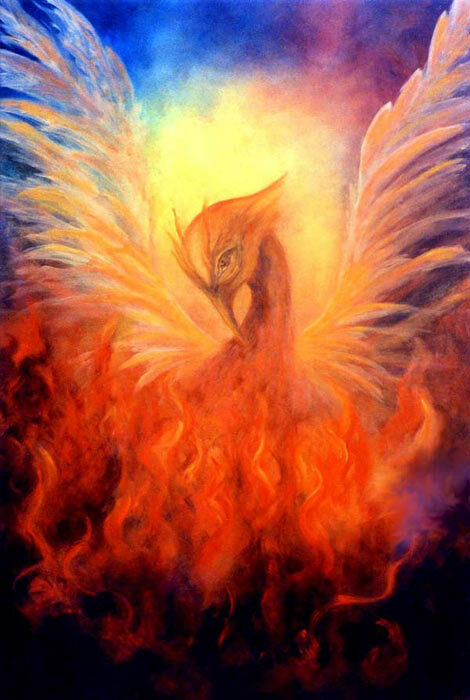 “Expanding further the horizons of consciousness, we now come to beings representing the Fire Kingdom. This world is closely related to the fires of spirituality. From the world or element of fire originate Intelligences which govern, stimulate and regenerate the lives of human beings, of Angels, and of all the forms of creation. Beginning with that Fire Being known as the Amfri (AHM free), we enter into a consideration of the ranks of the Pure Ones who deal most deeply with men. The Amfri is an Intelligence who stands upon a level of development comparable to a Guardian Angel. This glowing, fiery Presence works through the mental dimension primarily. He may travel as low as the astral world on occasion because He is constantly watching for spiritual fires of aspiration rising from earthians. These beings might justly be called, the “celestial spirituality watchers.” Many human beings are fire-like for only brief periods; yet in those moments, when all the bodies and faculties are united in their ardor, the Amfri have opportunity for entering into more direct contact with man. Through the Divine Source and through the fire of incentives, human beings receive an impregnation and an inciting of inner at-one-ment. These Holy Ones are constantly seeking persons in physical bodies who are strongly desirous of reaching toward Light. They witness the auric fires which momentarily flash from individuals. They hover over such souls with a love, similar to that of the Guardian Angel and endeavor toward the cleansing of all the dross which weighs them down, hardens them, and separates them from God-Light. Man in his highest moments is spiritually at-one with the great Fire Being who offers him liberation from his imprisonment in matter. After an earthian achieves spiritual steadfastness, his reverence resembles a flamelike aureole burning brightly in his aura. Issues of new stimulus shall brighten the fiery powers of his reception as spiritual worship keeps him constantly in the surveillance of these Eternal Ones. When initiation is experienced by the human being, that Amfri responsible for the conditioning of the human soul makes a spiritual contact with the next higher order above Him. Members of this group now become the next channels for the flow of electrical baptism. The Firl (furl) are of greater development than the Amfri and are to be found only in the Causal World which is their homeland. Here in the Causal World constructive, advanced Fire Beings manipulate electrical properties which they use for the further unfoldment of third dimensional individuals who are ready and receptive. The Firl’s power comes into active play in man’s regard when his whole being yearns for purity, for dependability, and for fidelity to Light. Amfri Angels condition individuals, both in consciousness and in auric radiation, to stand the super-charging which activates all the major initiations. It is interesting to note how many minds and lives contribute to one soul’s rebirth. Among human beings there are countless members who have helped prepare an individual for enlightenment. Among a human being’s associates who are in physical bodies, there may be as many as seven or more who are actively interested in this individual’s advancement. On the Angelic side, beginning with the Guardian Angel, there are an equal number of Angelic Intelligences who contribute to a human’s enlightenment. This group consists of Guardian Angels, Karmic Angels, the Amfri, the Firl, and others. Together the Angels make possible, at the proper moment, a grounding of solar beams which change the consciousness and habit patterns of the human they touch. Whereas an Amfri concentrated on an extinguishment of the dross in His human charge by seeing that it was burned through soulic fires from within him, a Firl’s specific duty is to wield a soulic or electric baptism through the higher bodies for the purpose of initiation. 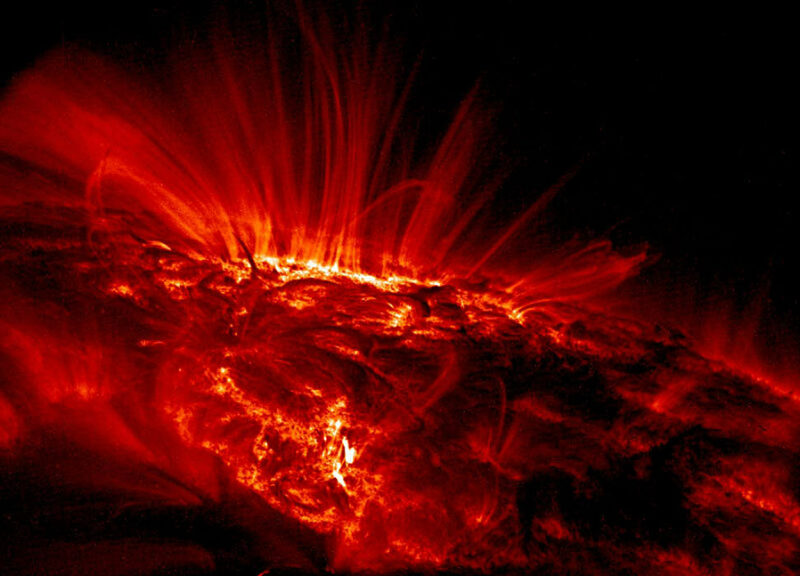 Aureole of fiery emanations around enlightened humans. 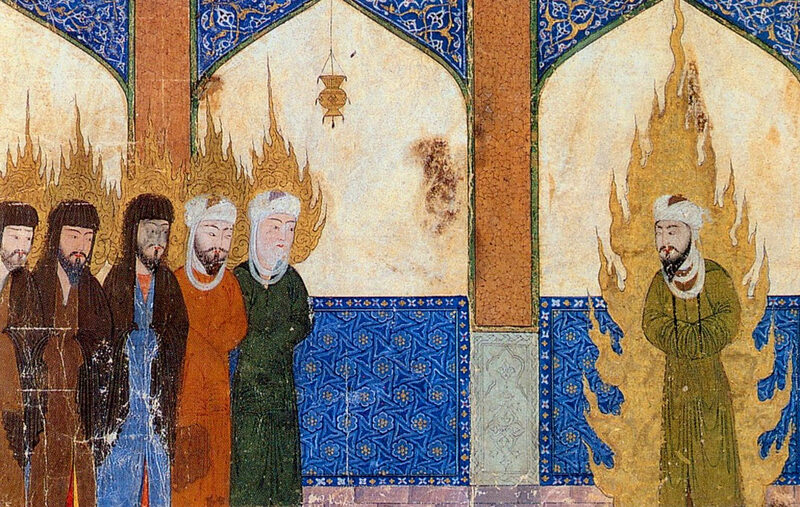 Medieval Persian manuscript depicting Muhammad leading Abraham, Moses and Jesus in prayer.